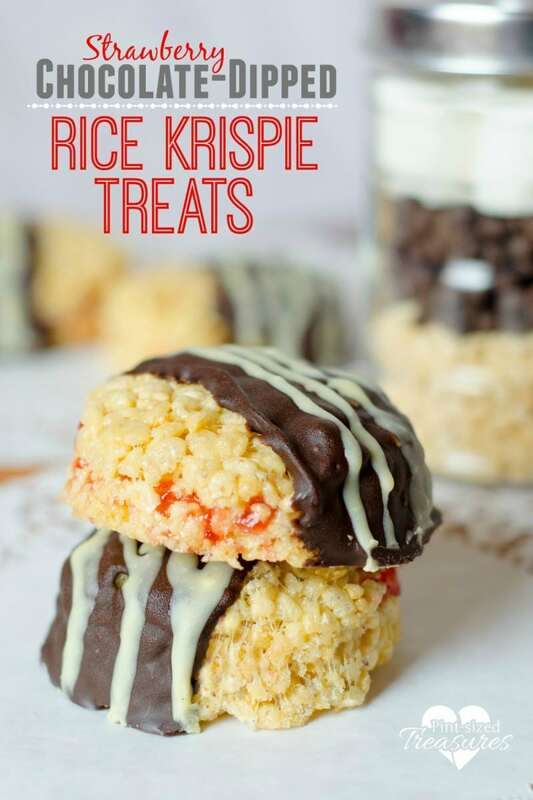 Are you a fan of rice krispie treats? Who isn’t? This recipe takes your traditional treats up a notch — or two! Strawberry-filled and dipped in chocolate and then topped with a white chocolate drizzle — oh yeah. These are swoon-worthy for sure! Taking classic sweet treats and adding creative flairs make them party and guest-worthy. Seriously, chocolate and strawberry flavor speaks of luxury, romance and decadent. 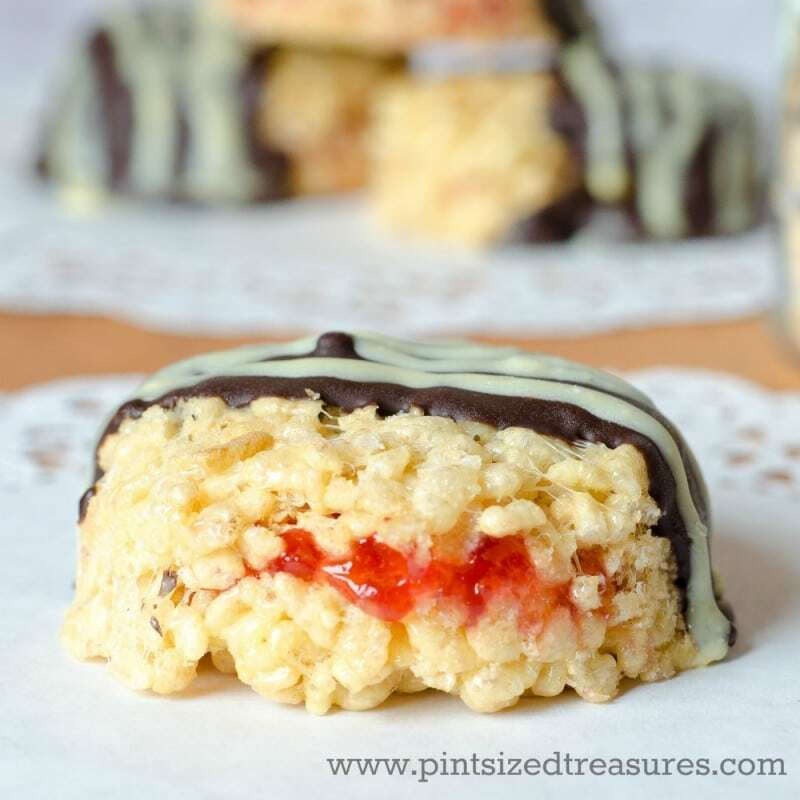 Can you make a rice krispie treat fill all those descriptions? I think so! When it comes to luxurious sweets, truffles, cheesecake and chocolate dipped goodies top the list for me. Don’t worry — just because a dessert or treat ranks high up on the luxurious list doesn’t mean it has to be difficult to whip up! In fact, easy desserts are kind of my “thing”. I don’t like to spend hours in the kitchen cooking, though I enjoy creating recipes, but I also want to enjoy time with my husband and kiddos. Easy-peasy recipes are a must! 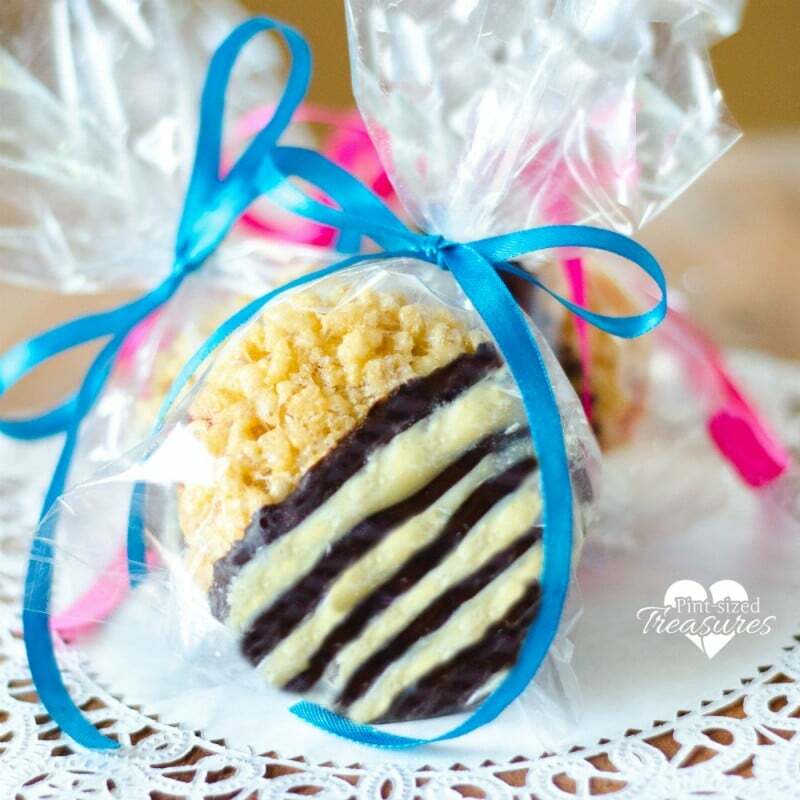 These yummy, chocolate-dipped streats are also perfect for thoughtful, homemade gifts. I remember when my teacher gave me a rice krispie treat as a gift. It was super special and made school seem a little less cold and unwelcoming. 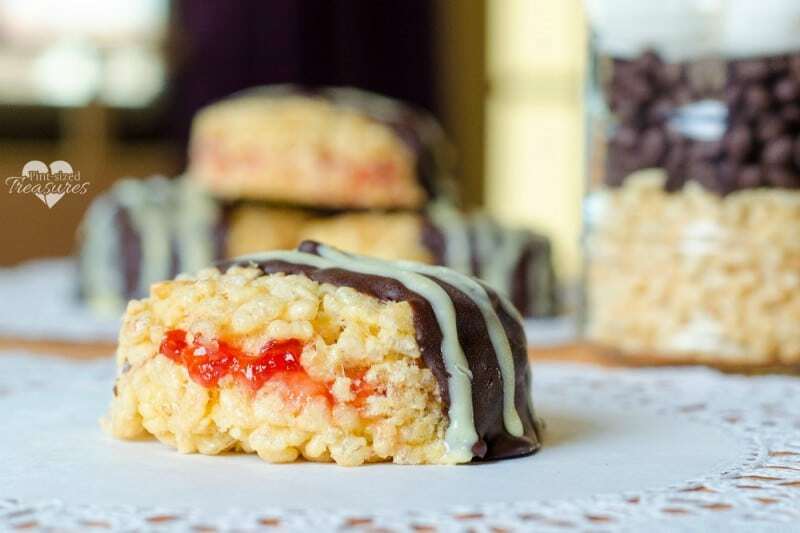 Do you know someone in your life that could use some rice krispie treats? To satisfy your sweet tooth, you’ll find the recipe below! Enjoy! Add rice cereal and stir until coated. Press mixture into greased or parchemnt lined 13 x 9 x 2-inch pan. Cool and refrigerate for one hour. Once cooled, using a lightly greased cup, cut treats into circles. Now, place one tablespoon of strawberry jam on half of the circles. Cover with the remaining circles to make several treat "sandwiches" and press down firmly to seal edges together. In a double broiler, melt the chocolate chips and shortening until smooth, stirring as needed. Take your circled sandwiches and dip into the melted chocolate chips. Place on waxed paper and refrigerate until cool. Once chocolate is cooled and set, melt white chocolate with one tablespoon of shortening in a double broiler. Drizzle white chocolate on top of the circled treats. Refrigerate treats until ready to serve.